Americans often take pride in ways their nation differs from others. But one distinction — lack of a nationwide policy of paid maternity leave — is cited in a new report as an embarrassment that could be redressed at low cost and without harm to employers. Human Rights Watch, based in New York, focuses most of its investigations on abuses abroad. But on Wednesday, with release of a report by Walsh on work/family policies in the U.S., it takes the relatively unusual step of critiquing a phenomenon affecting tens of millions of Americans. 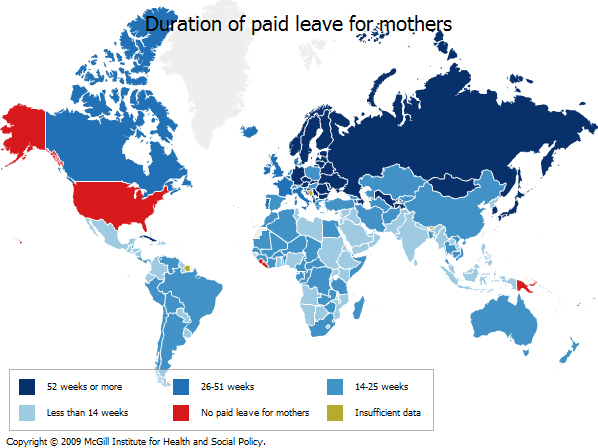 The social and economic benefits of paid family leave have long been apparent to the rest of the world. In fact, today the U.S. one of just a handful of nations (among them, Swaziland and Papua New Guinea) that don’t ensure some form of paid leave for new moms.